My name is Lukas. I’ve been an avid permanent style reader for several years and absolutely love your articles. For about four years, I have been altering RTW blazers, trousers and suits. On two occasions i’ve also had MTM suits made. Having read a great deal and grown more confident in my preferences and style, I’m ready to make the next step to bespoke. As in all things, you learn with experiences so I don’t want to pay a huge amount for what will undoubtedly be a first foray. On the other hand, I realise that 50+ hours of labour goes into a bespoke suit so I don’t necessarily want to go for the cheapest option. A key contender is a travelling tailor, such as WW Chan, which has a fairly solid reputation and costs approximately £1,000. The problem is that I don’t know the process of traveling tailors, nor understand how fittings are arranged over the various visits, or even a single visit. Can you offer any insight and guidelines I should follow to get a positive result? The process that a travelling tailor follows is essentially the same as a local tailor, except that the points at which you can meet are more limited and structured. You will still visit him the first time to be measured and discuss the suit you want; you will then have two or three fittings (on a first suit) the next few times he visits; and the final suit can either be collected or sent to you when finished. The problem is that if one more fitting is needed, it delays the delivery of the suit by a month, three months or even a year, depending on how often he visits. 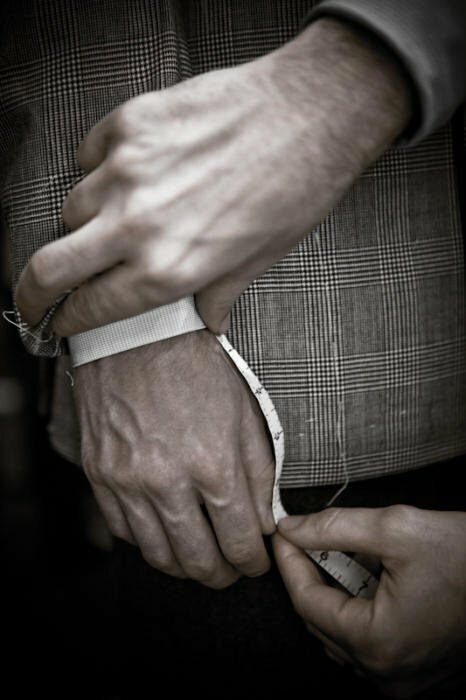 That’s fine with some stages in the process: getting from a basted to a forward fitting will take the tailor a few weeks, unless the workshop is working exclusively on your suit. But it can be frustrating with other, smaller changes. It’s the same if you’re visiting a tailor abroad. For this reason, many tailors try to find ways to save time or even save a fitting when they can. If you visit Cifonelli in Paris, Lorenzo might measure you up in the morning and make a rough, basted fit in the afternoon using waste cloth. If you tell the tailor in advance what cloth you want, they can even do that rough fitting in the right material (as I did at Langa). Camps de Luca uses a fit jacket with a grid, in order to try and get the balance right first time. You should be suspicious of visiting tailors that promise to make suits too quickly. The 50+ hours of work you mentioned cannot be compressed into three days, no matter how many Hong Kong tailors tell you otherwise. But some elements can be done the same day. At Ferdinando Caraceni, we had two basted fittings in a day: here, the second is essentially a chance to look at the baste again, with the changes from the morning, to ensure the jacket now has the perfect balance. The things that cannot be rushed are going from a basted to a forward, or from a forward to finished. As well as WW Chan, who you mentioned, I would recommend Caliendo, Solito and Vergallo, all of whom I’m sure you’ve read about here in the past. You can follow the discussion on How to work with travelling tailors: Reader question by entering your email address in the box below. You will then receive an email every time a new comment is added. These will also contain a link to a page where you can stop the alerts, and remove all of your related data from the site. Correct me if I’m wrong, but of the final 3 houses you recommended, doesn’t only Solito make U.S. visits? It might be worth checking out JW Hooke in the City (if you are based in London?). They are bespoke and come in at around £1,000 for coat and trousers, depending on cloth. I have used them for years and are very good for the price point. Perhaps worth a visit? Ask for Dean. Hi Simon, can I pick up on something mentioned in a comment on the Vergallo Loden article. Could I encourage, where appropriate, the possibility of linking items to any video content (perhaps on YouTube) you might shoot. You have a good, clear, warm style on camera (as per Harrods clip) and video might pick up on some more of the details. Whilst not always appropriate to all articles I do think that it would greatly enhance visits to factories, workshops and particularly tailors. Of real value would be short interviews with the key people within the article. I believe a `house style` of content would add value for readers/viewers whilst adding to the Permanent Style brand. Extra work I know but steps could be incremental. Where can i find tailors that can do good finishing, neat suits, for cheap price in Italy? what about in all Europe? okay, how can i get Jonathan Clay contact ? How are payments made in trunk shows? Do you settle the amount in during your first visit, or is it a half upfront and the other upon delivery? Also, are payments made solely by credit/debit cards or is cash a viable option too? Usually it’s half and half, yes. I would never recommend paying everything up front. And some are happy to take cash, though always helpful if you can pay by credit card too. I’d check that in advance. Been reading blog with great interest, and on your advice have taken the plunge into bespoke with W&S in London. I’m now considering some of the visiting Italian tailors for a more casual sports coat, and was wondering how per point #1, one looks at bunches in advance of a visit. This is particularly so as some tailors, like Vergallo, are booking 30-minute appointments, in which the consultation, cloth selection, and fitting is supposed to happen. Are there places/ways you’d recommend for previewing/buying cloth in the flesh in London with a view to ultimately working with a traveling tailor? Do you suggest buying cloth in advance and providing it to the visiting tailor at the first meeting? Do you have any idea what’s the minimum amount of customers required by a tailor to travel to a certain location?? ?